The trip back through the islands to Poros enabled us to spend our wedding anniversary on land. 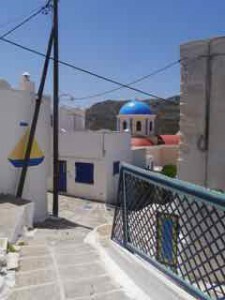 We couldn’t resist another walk up the ancient path to the chora, especially as it wasn’t too hot. 17 days since the last expedition and lots of changes. Previously it was May Bank holiday and many had been on strike or hanging around putting the working world to rights. Today the couple of little schools were open. One has a tiny courtyard with school room and juts off the steep hillside while the other is a single larger building with expansive walled playground shaded by a huge pine tree. Both were enjoying a colourful and noisy playtime. No more than 15 children to be seen in either. A group of energetic cyclists chose the highly unpleasant job of propelling themselves in an eye-watering slick of lycra, round and round the narrow gritty road to the top whilst a number of other tourists chose the bus. We all seemed to arrive in a dusty heap at once. Sad to say our favourite cafe was closed so we settled down outside a traditional dusky kafeneio and ordered an ouzo meze. Anyway they approached us, and, admitting to being English, asked to share the tiny round table. We loved the story which quickly unfolded…Josie and Bill had made the huge decision in the 70’s to leave their rat-race life near Crawley and move to a tiny village in the Welsh borders. They downsized job and income but the local real ale and cider together with car free lanes and a slower pace meant for a more contented life together. Very soon Bill’s brother decided to follow. He threw himself into the project with even more enthusiasm and bought a traditional unmodernised cottage with several acres where he and his wife brought up 5 children. No electricity or mains water were connected then and nothing has changed.The outside loo remains to this day as does the large tin bath, relic cooker and singular cold tap. Josie’s washing machine is apparently everyone’s best friend. We asked if the 5 kids had adopted a similar lifestyle or rebelled and gone the other way. One of the daughters, with husband and two kids apparently lives on the family land….in an iron framed 1950’s caravan…which has had a couple of ‘enlargements.’ When the children arrived two extensions were added…and when that wasn’t enough they built a cellar below! ‘Crumbs how did they get planning permission for all that?. Was the next question. ‘Oh nobody knows anything about it,’ exclaimed Josie. A jolly descent followed, on foot for us, as usual. Who says the Greeks are the naughty ones?